Oxalis stricta's clover-shaped leaves and delicate yellow flowers. The yellow wood sorrel is a small, low-lying plant that measures approximately 15-38 cm. in height. This wildflower is easily recognizable by its light-green, clover-shaped leaves. Its flowers are small, delicate and yellow in color. Yellow wood sorrel flowers are buttery yellow in color and relatively small, measuring 1.5 cm. in width. This radially symmetrical flower has five petals that surround ten stamens and a singular, erect central pistil. Flowers are widely spaced and moderate in number per plant. The small, capsule-like fruit is positioned at a sharp angle atop the terminal shoot of a straight or ascending stalk. The clover-shaped leaves of the yellow wood sorrel are relatively small, measuring approximately 1.5-2 cm. in width. Leaves are palmately divided into three distinct lobes and have a mildly sour taste. These leaves open at dawn and close at dusk or when exposed to environmental stresses.Each plant holds several leaves, creating a dense, carpet-like growth form. The yellow wood sorrel grows best in open field, along roadways, and around waste areas. 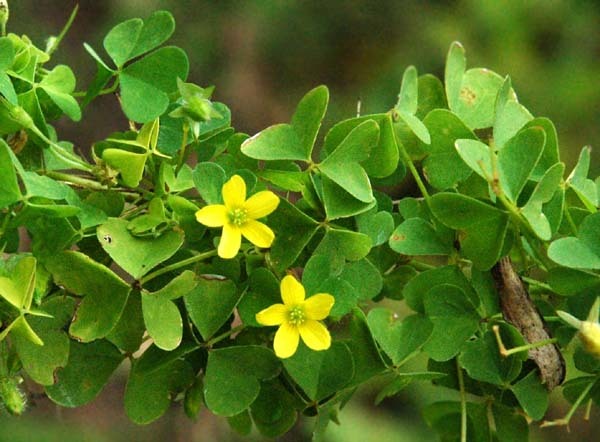 Yellow wood sorrel is also known as sour grass because its leaves have a mildly sour taste. In fact, every part o this flower, including the leaves, flowers, and seed pods, are edible. Sorrel is a common addition to salads, soups, and sauces and can be used to make tea. It contains high levels of vitamin C, potassium oxalate, and oxalic acid, the last two of which can be potentially hazardous to people with kidney disease, arthritis, or gout. Medicinally, in moderate dosages, wood sorrel is cooling (refrigerant, febrifuge), diuretic, stomachic (soothing to the stomach, relieves indigestion), astringent, and catalytic. It's also attributed with blood cleansing properties and is sometimes taken by cancer patients. The whole plant produces an orange to yellow dye.